I don't know about you.. but I love getting pretty packages in the mail. You know, that feeling when you've purchased something online and waiting for it to arrive...and when it does, they package it soooo nicely. 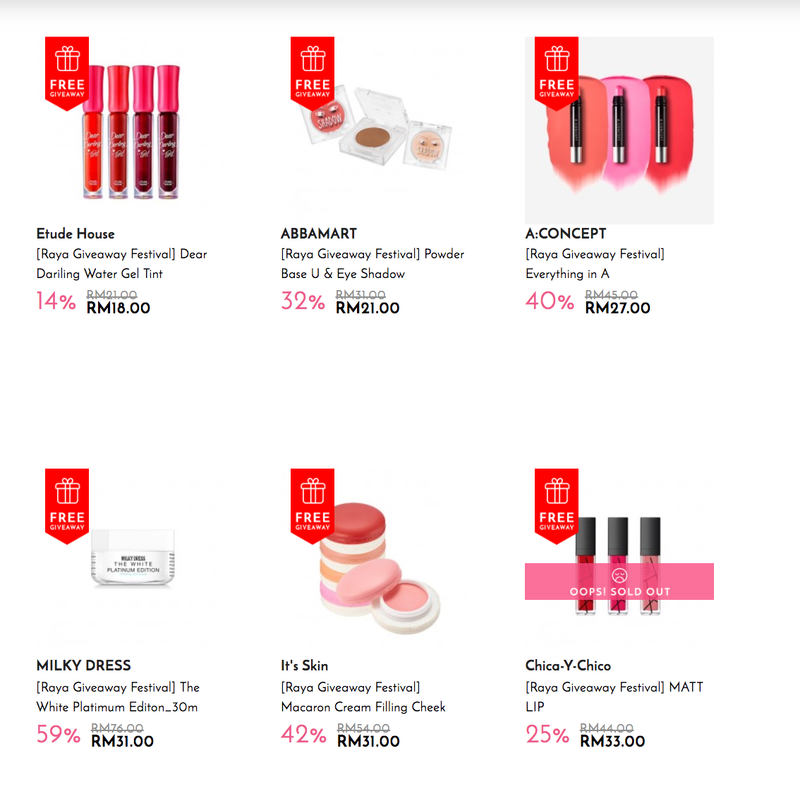 The only website where I purchase my Korean beauty stuffs, Althea Korea, has now done it again! They've come up with beautiful Limited Edition Althea Ramadan Box(pictured above) that you'll get when you make your beauty purchase with them this month. They're also having a Raya Giveaway Festival where you'll get one fabulous item of your choice. A beautiful box AND a free item? ?What are you waiting for? I always make sure that I remove my makeup well everyday. I actually have a three step (cleansing water + cleansing cream + facial wash) that I do every night. 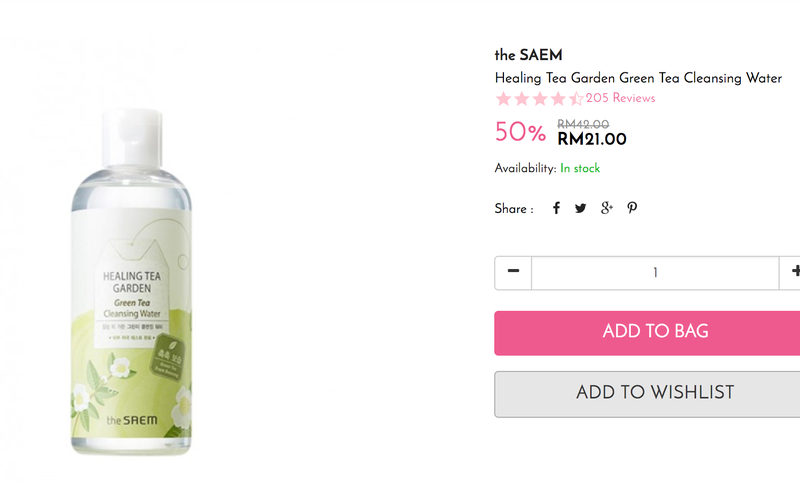 The first step that I do is to use a cotton pad and saturate it using the SAEM cleansing water (above). Then I'll wipe my face gently. The cleansing water removes my makeup very well..even waterproof mascara!I've almost finish using the entire bottle (which lasts up to..4-5 months)and will definitely repurchase it! I don't really wear sleeping mask every night because my skin is sensitive and anything too rich will make my skin breakout!eeek. 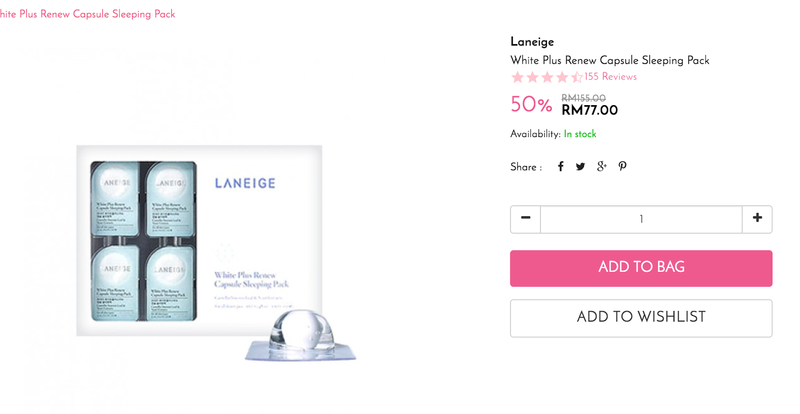 BUT..I've used the Laneige White Plus Renew Capsule Sleeping Pack and it doesn't cause my skin to breakout at all.My skin feels and look much smoother in the morning as well..the fact that it brightens it is a bonus as well.I use this once a week/two weeks. Because I wear makeup almost everyday, I like to use a face mask once or twice a week to detox it. I loveee Innisfree Jeju Volcanic clay mask..this is a new one from them and it works well to remove the gunk from your face and unclog your pores. Major love! That's my recommendation for you girls (or guys) out there! I hope that you'll have fun browsing and shopping on Althea. The prices are amazing that I don't think you'd be able to not buy anything there. haha.